A szabásminta és a leírás könnyen követhető, egyszerű, még angolul nem tudóknak is ajánlom, mert részletes, fényképes, szerintem mindenki számára érthető. Nagyon jó az is, hogy újszülött mérettől 10 évesig elkészíthető, így nagyon sokáig használható a szabásminta, jó befektetés. Az angol nyelvű ajánló végén megtaláljátok a blog túra többi állomásának hivatkozását és a tervező Etsy boltjának linkjét, ahol meg is lehet vásárolni a mintát, most 15 % kedvezménnyel, sőt meg is lehet majd nyerni. I had the opportunity to test a sewing pattern during summer (my first pattern testing :) ). Now the pattern is out and the blog tour arrived to me, so I can show you our version of Lisa's Big Little Pixie Pants. Lisa has a lovely blog and I like her style very much. So do my daughter, so I was really happy to be able to test this lovely pattern. It is not only very cute but versatile, too. I sewed it from light denim, so it is wearable during summer days with sandals and a T-shirt, now in autumn with socks and long sleeved T-shirts, and it will also be suitable in winter with tights and pullovers. It is really super. And for summer time you can also sew the shorter version of it. You can make it with or without pockets. Lisa's pattern and description are easy to follow, a beginner sewist can also manage to make these pants. I enjoyed how easily the pants turned out while it has a professional look. I love that it fits my daughter but also leaves enough room for her to move. She loves her pair, too. She can easily move in it thanks for the elasticized waist, she jumps, runs and climbs trees in it. Another advantage of the pattern is the size scale which is from newborn to 10 years (wow!!) Go and have a look how other testers' pairs turned out and now you can buy the pattern wtih discount until 23 Sept. and there is going to be a giveaway, too!!! Great news! Lisa is offering 15% of the Pixie Pants Pattern here and the Pixie Shorts pattern here for the duration of the tour. All you need is the coupon code PIXIEPANTS15, valid until Tuesday 23 September. Be sure to check back in on the Big Little blog on Tuesday for a giveaway too! Tues 23 Viki - posted by Big Little and a GIVEAWAY! 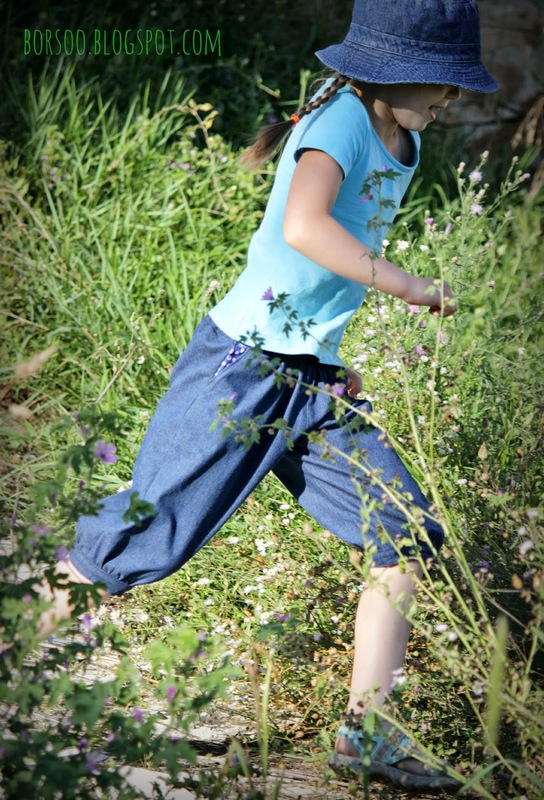 Having only seen the the pattern on small children, it is great to see how these pants look on an older child. Lovely photos. Gorgeous - and the photo's are stunning! Thank you so much for the opportunity, my girl loves this pair so much...she wants to wear it ever day, so I will definitely sew another pair in weeks time from corduroy, I think. csinosan vagány. vagy vagányan csinos :) mindegy, hogy hívjuk, mestermunka!